We came seeking a few days of enlightened relaxation in the company of experts. We were not disappointed. Dr. Phil and Elaine are unassumingly wise and alert to what really matters. They both love what they do and their enthusiasm is infectious. We are looking forward to joining them again next year.” (Dennis, Dublin). 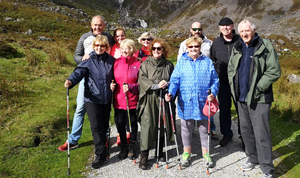 “We loved when our Waterford Camino led us to the Mahon Falls. Here, you feel you’re on hallowed ground, a cathedral of stillness carved out of rock that dates back over 300 million years. It takes 20 minutes to walk out to the thundering Falls. They cast a mystical spell, like a dimmed oasis in a cauldron of stone. We slowed down to soak in the vast kaleidoscope of contour and colour that opened up before us from the Falls to the sea beyond. This ‘compass point’ on the Waterford Camino is one that we want our Grandchildren to experience. Spellbinding!” (Mary, Maynooth). “The Crough Woods trail is memorable on so many levels. All the senses come alive. The sounds of the cascading waters, the birds chirping, the autumnal light seeping through the trees, all combine to carry you through this mystical forest trail as you take the 6km Camino uphill to the Mahon Falls. Certainly gives you plenty to chat about as the sun sets over a creamy pint of stout.” (Kevin, Cork). 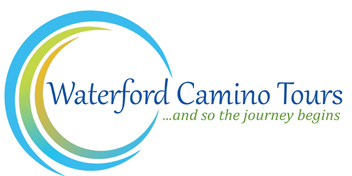 “We feel honoured to have been part of the Waterford Camino tour. What can we say; fabulous, fun, scenic, breathtaking, inspiring, generous, kind, loving. 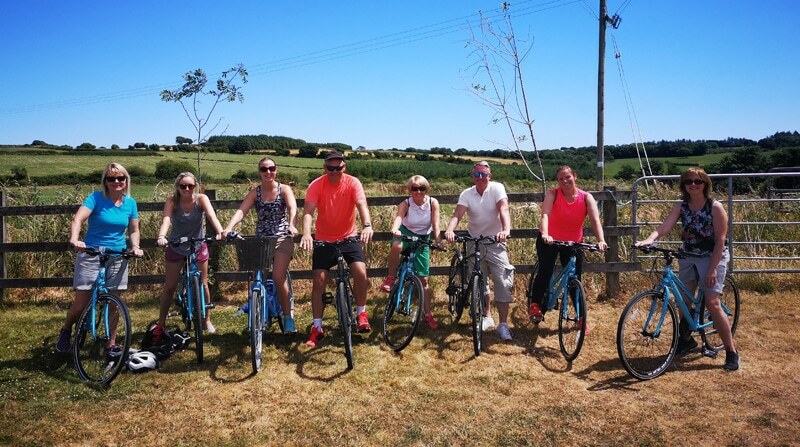 Everyone needs to experience this amazing tour through Ireland’s Ancient East in this hidden corner of this beautiful country.” (Jo, Wexford). “Was it the beauty of Mahon falls or the water rushing through Crough Woods or the walk in Durrow Tunnel on the Waterford Greenway or the lovely boat ride in Dunmore East? I’m not sure but something on this unique Camino changed me that day…. Somehow the dark cloud lifted, if not completely, enough to see the beauty around me, enough to revive my hope. The people I walked the Camino with had become my wounded healers who shared their light with me. Nature inspired me to see that all need not necessarily stay the same. Somehow I am not scared to go the hard route to climb my mountain. I have started to dream again.” (Jas, Kilkenny). “Mother Nature shows off in full force along the Waterford Greenway. Easy nearby jaunts include the fishing village of Dungarvan, the stunning beaches of Tramore, the peaks and waterfalls of the Comeragh Mountains, and the crown jewel of Dunmore East. The scenery here rivals any vista of the renowned West Coast. Whatever type of holiday you dream of, I highly recommend making a pilgrimage with Waterford Camino Tours.” (Stephanie, New York). “Dunmore East… where have you been all my life? We love you! The trail from the harbour to the picturesque Portally Cove and back will stay with us forever. It is simply breathtaking in its beauty. We even spotted the occasional seal basking in the sun. Hook Head lighthouse simmered against the sparkling waters on the horizon. The descent into the photogenic fishing harbour of Dunmore East reminds you of something from times past. The Camino by land extended to the sea as Brendan brought us out to the Bay after lunch. We caught mackerel and lobster, no mean feat over a few hours. We had to celebrate when we got back to dry land. Dunmore East from the cliff to the sea is a sight to behold.” (Ann, Gorey). I spent a wonderful 3 days with a small group and of course Phil and Elaine. I saw a part of Ireland I did not know. We had beautiful locations and quiet reflections. The silence on a cliff top was wonderful. But so also was the music, the poems and thoughts. Phil’s enthusiasm for life and change was softly encouraging as was Elaine’s support and guidance. No preaching was done. The stunning meandering beaches of Tramore Strand on Sunday afternoon blew the cobwebs away and set us up for what was to come. I gathered a stone to carry on my way and my Camino had begun. Retreat and reflect, pause and wonder with every step we took. Sunshine warmed our hearts and souls as we wondered woodland and mountain, while the water at Mahon Falls cooled our warm feet….we rested awhile in this splendid amputheatre of carved rugged rock. The falls cast a mystical spell as one soakes in this sacred ground. In Crough Woods, birds song,the light peeping through the autumnal leaves, the sound of water all heightened the senses and sooth the heart as we journed through this forest trail. Passing through Durrow Tunnel was like passing from the cold darkness to be bathed in the dappled warm sunlight. In Dunmore East we extended our Camino by land to the sea, where a special fisherman Brendan took us out to sea in his fishing boat. He uprooted his lobster pot from the sea to reveal his catch of lobster and crab . We celebrated his catch with song and Elaine made tea and Dr. Phil provided cake….breading bread together was just another honour to be shared on what was truly a remarkable experience. Was it the company, the weather, the majestic landscape, the convergence of land and sea,mind and spirit that reawakened us to our own treasure within and reaffirmed our belief in ourselves? I’m sure it all combined to help us evaluate and appreciate life. Dr. Phil and Elaine are both atunned to what really matters in life and their sincerety and enthusiasm is enlightening and contagious. They were very turned into the group and took time to share with each of us. 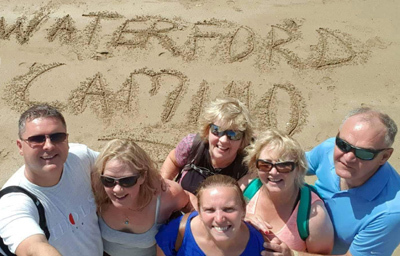 The Waterford Camino was a truly therapeutic experience for us and one that we would like to repeat again next year.